This veteran wears an incomplete Army Class A uniform, which goes against AR 670-1. Every branch of the U.S. military has its own distinctive uniform for daily wear. Additionally, each branch has a specific dress uniform. Unlike the other branches, the Army has two dress uniforms — the Class A uniform and the Dress Blue Army Service uniform. Each military uniform is governed by a branch-specific regulation that all service members must follow. Not all uniforms are appropriate for all situations. For example, attendance at a military ball or other formal event requires a dress uniform, while daily work requires wearing the branch's everyday uniform. 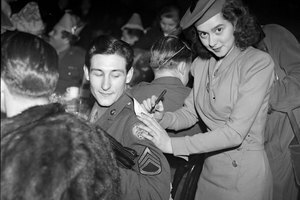 Determine what colors are part of the pattern on the military uniform. The Army's combat uniform is a digitized pattern in a combination of olive, gray and light green. The Air Force and the Navy use a digitized pattern consisting of several shades of blue, and the Marine Corps uses a digitized pattern of brown, olive and light and dark greens. The U.S. Coast Guard wears a solid blue, button-down shirt with solid blue pants. 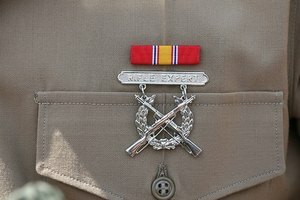 Read the branch tape on the service member's uniform. The branch tape is located on the left breast of the blouse on all military uniforms. The branch tape will read: "U.S. Army"; "U.S. Navy"; "U.S. Marines"; "U.S. Air Force"; or "U.S. Coast Guard". Look at the service member's boots. Army and Air Force personnel wear tan suede boots, while Marine Corps personnel wear olive boots. The Navy and Coast Guard require service members to wear black boots. Determine the color of the dress uniform. The Army's Class A uniform is olive green, and the Dress Blue uniform is dark blue; each has gold rank insignia on the sleeves. The Marine Corps' dress uniform is dark blue with red and gold rank insignia on the sleeves. The Navy's dress uniform is completely white, and the Air Force dress uniform is dark blue with white rank insignia on the sleeves. The U.S. Coast Guard's dress uniform is also dark blue with white rank insignia. 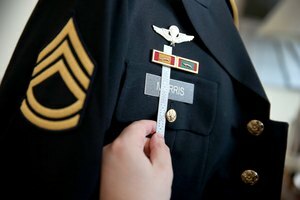 Identify the enlisted rank insignia on blue dress uniforms to determine the service member's branch. 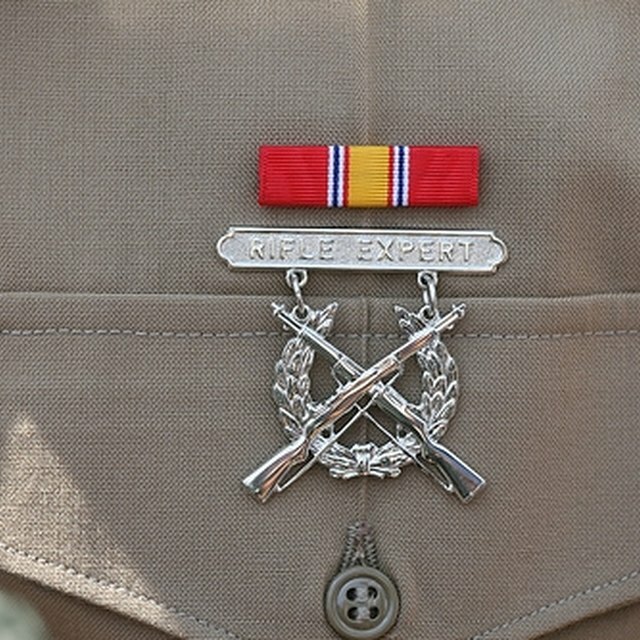 Gold rank insignia is the hallmark of the U.S. Army, and gold and red rank identifies a member of the Marine Corps. However, the Air Force and Coast Guard both have white rank insignia on their dress uniforms. Most of the Air Force's rank insignia consists of upward-facing chevrons, and the Coast Guard generally uses diagonal slashes to denote rank. Ask the service member wearing the uniform, if you are still unsure. If the uniform is not being worn, check the uniform regulations on each branch's official website to determine what type of uniform you are attempting to identify. Do Handbags & Shoes Always Have to Be the Same Color? Talent, Eva. "Identification of Military Uniforms." Synonym, https://classroom.synonym.com/identification-of-military-uniforms-13583605.html. 04 October 2017.